Google may have started out as a Web search engine, but the company now offers many other free services to users. Whether you are looking for a calendar to keep track of your appointments or a free e-mail account, Google has you covered. One of Google's less well known services is Google Translate which provides free translation between a number of different languages. Google Translate allows users to read foreign language newspapers, access publications by foreign governments, and even read literature via the translation tool. Before obtaining an English translation from Google, it is worth bearing in mind some of the service's limitations. As a machine translation service, Google Translate does not always translate language perfectly. For example, if you need to translate a very important document such as a contract, Google Translate should not be used. In addition, Google Translate is limited to text – it cannot translate videos, audio recordings or conversations. Given that Google Translate is a free service, these limitations are understandable. If you need those additional services, you should get a professional translator to assist you. There are several ways to use the Google Translate service. The most flexible way to get an English translation from Google, or any other language, is by using the main Google Translate website. Here are step-by-step instructions on using Google Translate to convert a foreign language into English. 1. Go to the Google Translate website. 2. Enter either a website address (e.g. https://www.brighthub.com) or the text you wish to translate. As soon as you start to enter text, Google Translate will automatically attempt to identify the language. Check that Google has identified the language correctly; the service sometimes makes errors. 3. Read the translation on the far right hand side of the window. What if you have a Microsoft Word document or some other file you need to translate? Google Translate can convert those files as well. Here are the steps to translate a document using the website. 3. Locate the document you wish to translate and upload it to the Google Translate website. 4. Google Translate will then translate the document. Although Google translation for sites in other languages is possible, there are other ways to obtain an English translation from Google. There is no right way to use the service – it all depends on your needs. Google Chrome: This web browser has a built-in translation feature. iGoogle: The iGoogle homepage is a personalized start page anyone can get for free from Google – Google Translate can be integrated into iGoogle. 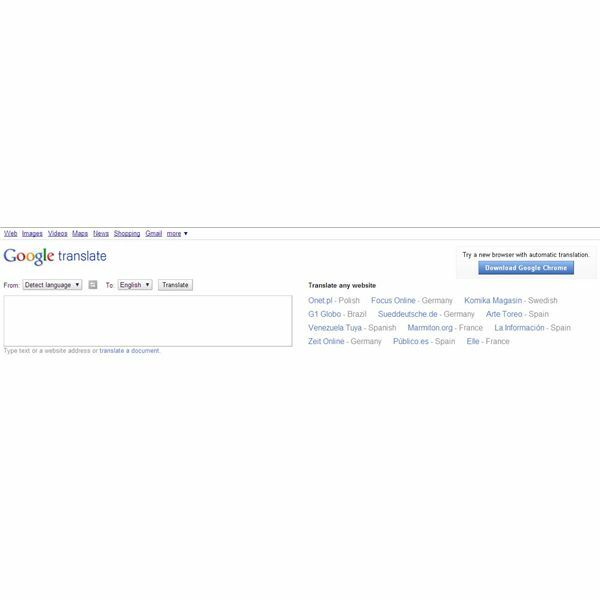 Google Search Results: In some cases, a "translate this page" link will appear next to a search result.